Originally from Europe, mistletoe was continuously a source of fascination for our Greek and Gallic ancestors who eventually turned it into a symbol of prosperity and long life. 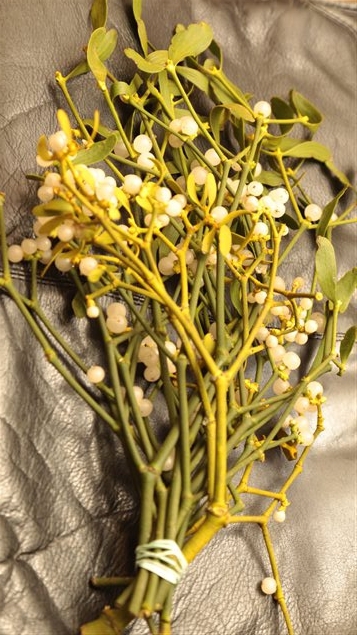 With only 4 or 5 branches of mistletoe you can easily make a beautiful bouquet to hang over the door. The legend also tells that enemies who met under a mistletoe ball would reconsider truce for a day before going back to war. Undoubtedly this legend has been the main source for the tradition of hanging a ball of mistletoe from the ceiling and kissing below as a sign of friendship. The best way to keep the branches alive for a long time is to keep them constantly fresh and damp as heat can dry them out.